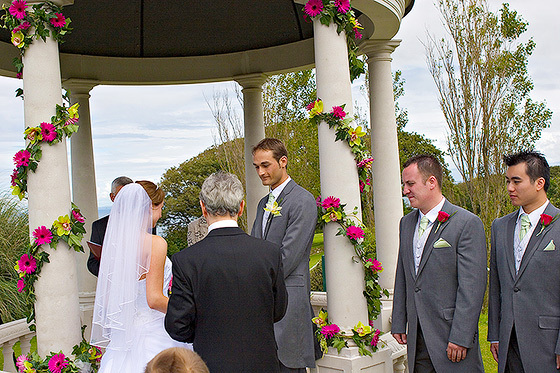 Civil weddings have become more popular in Cornwall for couples preferring a civil ceremony to a religious ceremony. Civil marriages take place mainly due to Cornwall being a destination wedding location and church weddings are still more difficult to plan if you do not live in Cornwall. Civil wedding ceremonies can be themed to your preference and so can your marriage vows. 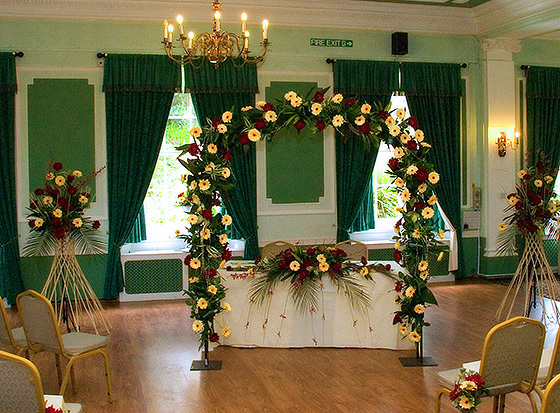 Most civil wedding venues will allow the room in which the marriage will take place to be decorated; flowers are often used to decorate the room to make the decor more personal to the bride and groom’s taste. If your civil ceremony is likely to take place outside, flowers can again be used to personalise your chosen ceremony location. This is an example of a wedding at Tregenna Castle at St Ives which is licensed for civil wedding ceremonies outside. Tregenna always prepare a room inside for the ceremony in case of bad weather. This is really important so always check before booking your wedding venue if you want to have your wedding ceremony outside. There are a host of locations for couples to celebrate their civil wedding in Cornwall and this will be the subject of future postings. Civil wedding ceremonies tend to be quite short though the ceremony can be extended considerably by having readings and perhaps someone to sing. You will find the teams at the registration offices in Cornwall very helpful and accommodating; “they’re a fun bunch who I see regularly” says Pervaiz. registration office which is a centralised telephone number; you need to ask to be put through to one of the offices. The telephone number is 0300 1234 181. Civil marriages in Cornwall have become so popular because Cornwall is renowned for its outstanding natural beauty. Many brides and/or grooms are familiar with the area having enjoyed holidays and family occasions in the county, several couples who have never been to Cornwall have located venues in Cornwall via the web and like the idea of being able to have their civil ceremony take place outside, hopefully in glorious sunshine. The other main appeal of civil weddings is the ceremony and reception normally take place at the same venue; often with accommodation. Everyone at the wedding can relax enjoy a few drinks without having to worry about driving or taxis. This convenience is an important consideration when planning a wedding particularly if members of the bridal party and wedding guests are not familiar with the area where the nuptials will take place. Wherever you choose to get married in Cornwall have a wonderful time and if you haven’t yet decided on a wedding photographer please feel free to check out the galleries of wedding photographs all of which are taken during live weddings in Cornwall, many of which are civil ceremonies taken during civil weddings of the many customers who have celebrated their civil marriages in Cornwall.